This week I’ve been making some pretty hearty meals, so a refreshing salad of crisp romaine has been a welcome accompaniment. With roasted ruby-red beets from the farm, my very favorite balsamic vinaigrette (from the cookbook I published in 2005, The Seduction Cookbook), a modest crumble of goat cheese, all nestled on top of that perfect, crunchy romaine, this salad can be enjoyed as a light lunch or a delightful side. Make it your own favorite by throwing in your favorite nuts, orange slices or top it with grilled chicken. In a blender, combine the shallot, vinegar, mustard and honey, and blend to combine. With the blender running, pour olive oil into the blender cup in a slow stream. When mixture combines and thickens, add salt and pepper to taste. Tip: Taste vinaigrette by dipping a small piece of romaine in it, you’ll have a better understanding of the flavor profile of the salad. Vinaigrette can stored in an airtight container for a week in the refrigerator. 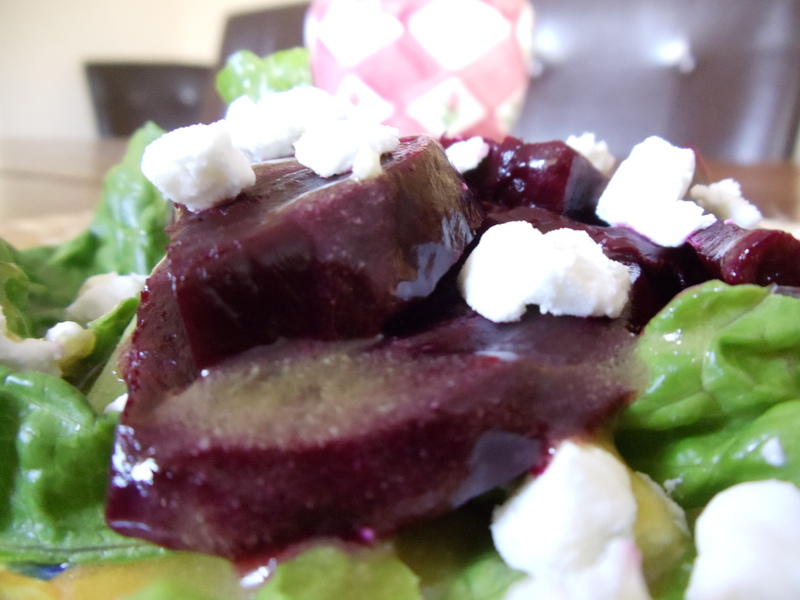 Combine the romaine lettuce, beets and goat cheese, then drizzle with the balsamic vinaigrette. Enjoy! I made it tonight! Added chicken, clementines and pecans as you suggested. Used mozzarella instead of feta. The dressing with the beets and oranges was so good! So awesome! I had the salad tonight too, the beets were amazing. Thanks for sharing River!